For the extreme aerobatic enthusiast, there is nothing like performing hotshot maneuvers inches off the ground. One unexpected way to take the crowd by surprise is to add aerobatic moves to your landing. During a normal landing approach, the airplane is in upright level flight and flies downwind parallel to the runway, turns 90 degrees to base, and then makes another 90-degree turn onto final approach. After years of flying, the process becomes second nature. If you’re like me, you’re always thinking of ways to add excitement to your flying, so let’s look at a landing that starts from an inverted position. When your airplane is just a few feet, or even several inches, from the ground, a half roll certainly will add a thrill. But it must be performed right before the aircraft touches down. Let’s take a closer look. This maneuver is definitely not for beginners. You must be able to land your aircraft with ease, and the required control inputs for inverted flight must be second nature. To overcome fear of any new stunt, I suggest using flight simulators and taking your time to practice. Aside from having a flight simulator, practicing with an airplane that is forgiving, yet precise, will also assist you. While I have noticed that I fly many of my foam park flyer models on high-rates with a generous amount of exponential, the maneuver this month does not require a lot of control surface deflection. The rate at which you wish to perform the half roll will dictate how much aileron deflection is needed. As a starting point, I would recommend 25 degrees of aileron deflection with 25% exponential, 20 degrees of elevator deflection with 35% exponential, and 35 degrees of rudder deflection with 50% exponential. Keep in mind that these rates and exponential values work well for me, so I recommend starting with the factory recommended settings at first, then fly your aircraft to altitude and see how it responds to your inputs. If you feel that the airplane is somewhat slow to respond on a given surface, examine it further. Apply full aileron input and see if you are content with the roll rate. If the rate is slow, increase the dual-rate value for the aileron surface. If the roll rate is good, but the airplane is slow to respond when the control stick is around neutral, decrease the exponential. As with a traditional landing, you should fly parallel to the runway, travelling downwind, and then perform a half roll to inverted. Now, instead of making two 90-degree turns to final, perform one 180-degree turn while inverted to line up with the runway. Once you are entering the runway area, slowly decrease the throttle to control your descent rate. As you prepare for the half roll, you may find that you have to add some throttle as the half roll will slow the aircraft down (depending on the roll rate). When you execute this stunt for the first time, perform the half roll at a fairly high altitude so that you can become familiar with the control inputs needed. Continue the descent until you have landed, applying throttle and pitch changes when needed for a constant rate of descent. 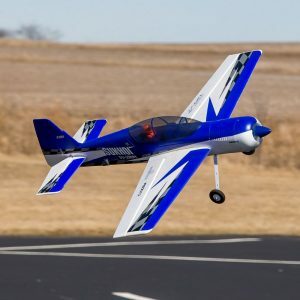 The E-flite Advance 25e is a 4-channel sport plane that’s ideal for learning to perform aerobatic moves like the inverted landing with a half roll. STEP 1: At about 50 feet away from you, align the airplane inverted and parallel to the runway, travelling downwind. For a plane with a 48-inch wingspan like the Extra 330SC, this gives plenty of time to prepare for the 180-degree turn. During the downwind leg, I prefer to keep the throttle around 25% so the airplane has some speed and will not stall. If a cross-wind exists, a higher throttle setting may be required. STEP 2: Perform a gentle inverted 180-degree turn with a bank angle of about 50 degrees. If downwind is from right to left, perform a left turn and bring the plane toward the runway. Apply some left aileron to initiate the turn and add in some down-elevator to maintain altitude and control the turning radius. Once the aircraft is aligned with the runway, apply a touch of right aileron to level the plane. After you become proficient with this maneuver, this should be a flat turn with not a lot of altitude loss. With proficiency, you can start to perform a descending, inverted 180-degree turn to bring the airplane extremely low to the ground. STEP 3: Now, while keeping an eye on your airspeed (so that it doesn’t approach stall speed), the airplane should be either level, or at most, pointed just slightly towards the ground as you perform the roll. Before this is done, add a little throttle to get the airspeed up a little. Next, determine the roll rate you want. If you wish to perform a rather slow half roll to upright, you will need to feed in rudder input during the half roll to keep the same descent rate. To roll to the left, apply left aileron and a touch of left rudder. As soon as the airplane is upright and level, neutralize your inputs and continue with the traditional landing pattern. STEP 4: Continue to balance the descent rate with throttle and pitch angle. When the airplane is only a few inches from the ground, add in a touch of up-elevator, adding a slight amount of throttle if needed, to keep the airspeed up. You don’t want to stall the aircraft with any hard pitch inputs. You can also perform this maneuver at a higher speed. For example, you can zoom across the downwind leg, perform a quick 180-degree turn, come off power, and perform a half roll with a combined slip. If you roll to the left, you can roll about 120 degrees and feed in a large amount of left rudder to perform a side slip to decrease your airspeed. Then, you can level the airplane just inches off the ground before landing. As with all aerobatics, the only limit is your imagination—as well as the ground! No doubt this maneuver takes some time to master. However, when performed close to the ground, it is an exciting way to end your flight. With time, different variations can also be thrown in to spice things up. For example, you can add different rolling elements, like two points of a 4-point roll or four points of an 8-point roll, to get back to upright before the landing. Spend time at the flying field practicing the maneuver and like all new maneuvers, break up the learning process into smaller steps until you have it mastered.